From the 15 April 1911 issue of Judge Magazine. 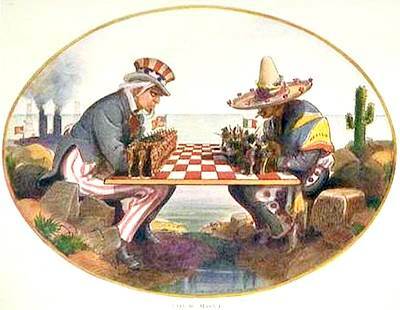 The cartoon shows Uncle Sam playing with an orderly formation of troops against a man labelled 'Mexico' playing with a rabble. Behind Uncle Sam are smokestacks and oil rigs. Behind Mexico is a cactus. Judge was a weekly satirical magazine published in the United States from 1881 to 1947. It was launched by artists who had seceded from its rival Puck. The founders included cartoonist James Albert Wales, dime novels publisher Frank Tousey and author George H. Jessop. The Mexican Revolution, also known as the Mexican Civil War, was a major armed struggle, lasting roughly from 1910 to 1920, that radically transformed Mexican culture and government. Fast forward 100 years: the tension on the USA - Mexico border remains palpable. I'll be back in another 100 posts to write 'Breaking the 2900 Barrier'. It promises to be a short post. Post no.2900 was Other 'Schachzeitungen', so here I am, as promised. It turns out that it's not going to be such a short post after all. According to Comparison of top chess players throughout history (wikipedia.org), Magnus Carlsen achieved the highest chess rating of all time, when he reached 2882 in May 2014. He's currently rated at 2845, still world no.1 but a long way from the elusive 2900. Some day he or another super-talented player might reach 2900, although it's anybody's guess when that will happen, if ever. For 2900 ratings, we have to turn to the world of chess engines. Here is a relevant chart signed Luke Muehlhauser and dated 2011. I've marked the 2900 crossover point with a red star. The engine under the star is Shredder 8.0 and the year was 2003 or thereabouts. As for 'Breaking the 3000 Barrier', the same chart points to Rybka 1.2 a few years later. Looks like I won't have to write the 3000 post at all. TCEC: KomodoMCTS and AllieStein finished 1st and 2nd in division 1 to qualify into the premier division with six other engines.  CCC: The four first placed engines are currently in a final where Leela leads by a comfortable margin, AntiFish trails by a considerable margin, and the two other engines [Stockfish & Leelenstein] are fighting for 2nd/3rd places. The preceding divisions were all '2x double RR (112 games)'. Stockfish is currently leading the premier division, followed by Leela (aka LCZero, Lc0), KomodoMCTS (Monte Carlo version), and Houdini. CCC: Leela was the surprise winner of CCC7, finishing ahead of Stockfish by a convincing margin. As for last week's comment, 'Stockfish & Leelenstein are fighting for 2nd/3rd places', Stockfish soon surged ahead of its AI/NN rival and the four engines maintained their relative positions until the end. The following chart shows the final score as published by the CCC organizers. At the bottom I've added my own W-L-D analysis. Leela beat Stockfish in their individual 100-game match and finished with a better percentage against the other two engines. 1) Stockfish was the only non-AI/NN engine to qualify for the final. 2) It was bested in the final by its main AI/NN competitor. CCC7 marked the symbolic end of the dominance of the traditional, handcrafted, alpha-beta engines. The passing of the baton to a new generation needs to be confirmed by a TCEC victory for an AI/NN engine, but that is a question of 'when', not 'if'. It is the parts 2 and 3 that will actually be a playing combination at TCEC. Part 1 is used in preparation.  Uniqueness: For an NN engine to be unique in the TCEC context, at least two of the three defining parts mentioned above have to be unique.  Eligibility for participation: A NN engine is eligible for participation in TCEC if it is considered unique by the Uniqueness definition above. It has only been a year since the AI/NN engines burst into engine-to-engine competitions. The organizers of these events are still grappling with the complications introduced by their appearance. A year from now what will be the rules governing their participation? You don't have to be a cheapskate to enjoy chess, but you don't have to be a millionaire either. This video proves the point. One comment said, '2 minutes... hmmm'. It's probably more like 20 minutes, plus the time to gather or buy the materials, but it's still an impressive concept. While I was collecting the 26 volumes of the Berliner Schachgesellschaft's 'Schachzeitung', I noted other periodicals having 'Schachzeitung' in their title. I'll cover these in another post. I created the following chart to keep track of the different publications. It shows which periodicals were published in which years.  DSZ = Deutsche Schachzeitung. The code 'V00' covers a period that overlaps with SZ. The '?' for 1879 means that I was unable to locate a copy in Google Books. Since I was getting further away from the initial scope of the search, I stopped here without spending much time on it. The numbers in the second line are references to Di Felice's 'Chess Periodicals, 1836-2008'. The references are expanded below. 789. Deutsche Schachzeitung (1846–1848) Vol.1, no.1 (1846)–Vol.3, no.3 (1848). Bi-monthly. Editor Herrmann Hirschbach. Publisher G. Brauns. Leipzig. Germany. Diagrs., tables, 23 cm. Magazine. General. German. Note No longer published. 790. Deutsche Schachzeitung : Organ für das Gesamte Schachleben (1872–1988) Vol.27, no.1 (Jan 1872)–Vol.137, no.12 (Dec 1988). Monthly. Editors Johannes Minckwitz and Adolf Anderssen (1872–76), Constantin Schwede and Adolf Anderssen (12/1876–78), Johannes Minckwitz (01/1879–12/1886), [...]. Publisher Veit & Co, later W. De Gruyter & Co. Leipzig, later Berlin. Germany. Illus., ports., 24 cm. Magazine. General. German. Note Continues Schachzeitung: In Monatl, with the same numbering. 1601. Neue Berliner Schachzeitung (1864–1871) Vol.1, no.1 (Jan 1864)–Vol.8 (Nov/Dec 1871). Monthly. Editors Adolf Anderssen and G.R. Neumann (Vol.1-4), Adolf Anderssen and Johannes Hermann Zukertort (Vol.5-8). Publisher J. Springer. Berlin. Germany. Illus., 23 cm. Magazine. General. German. Note No longer published. 2792. Wiener Schach-Zeitung (1855) Vol.1, no.1 (Jan 1855)–no.9 (Sept 1855). Monthly. Editor Ernest Falkbeer. Publisher A.A. Wenedikt (no.1-6), M. Auer (no.7-9). Wien. Austria. Illus.22 cm. Magazine. General. German. Note No longer published. 2358. Schweizerische Schachzeitung (1857–1860) Vol.1, no.1 (1857)–Vol.2, no.21 (1858); New Series Vol.3, no.1 (Sept 5, 1859)–Vol.3 (1860). Frequency and Publisher unknown. Editor Friedrich Capräz. Chur. Switzerland. Magazine. General. German. Note No longer published. For the third publication, Österreichische Schachzeitung, I found no entry in Di Felice. There are four volumes on Google Books, 1872-1875.
Who hasn't seen a picture of 'The Turk', that 19th century chess playing machine that had a strong chess player hidden inside it to take on all comers? I was reminded of this while working on the recent post Chess Player’s Chronicle : Frequency. The first annual volume was prefaced by a full page illustration of the Turk and by a 16-page article on the subject. I wondered whether the illustration and the article had found their way into the literature. First, here's an overview of Turk images using the technique last seen in Chess Playing Celebrities (March 2019). A copper engraving of the Turk, showing the open cabinets and working parts. A ruler at bottom right provides scale. Kempelen was a skilled engraver and may have produced this image himself. The art of constructing figures to imitate, by means of mechanism, the actions of living beings, appears to have been carried to great perfection by the ancients. In Herodotus we find allusions to what are considered to have been Automata amongst the Egyptians; and have positive testimony that, from the celebrated statue of Memnon, and even from its pedestal, after this wonder of Ancient Egypt was overthrown, beautiful sounds were emitted at the rising and the setting of the sun. Amongst the Greeks and Romans, artificial puppets, called Neurospasti, which could run round a table, moving their heads, eyes and hands, were common. When I submitted the first clause of the paragraph to Google search, it returned only a handful of references to various editions of the first CPC volume. Has the article not been reproduced elsewhere? This is a pity, because it is well written by someone who knew the subject. The same is true of many of the literary articles in the first volumes of the CPC. While I was preparing the recent post on JLA Chess Comics I searched my archive of chess images on the keyword 'comic'. The search returned more than 500 images, many of them having nothing to do with comics except as an unimportant word in the description. I spent an enjoyable hour researching the more unusual images, but ran into a brick wall with the image shown below. 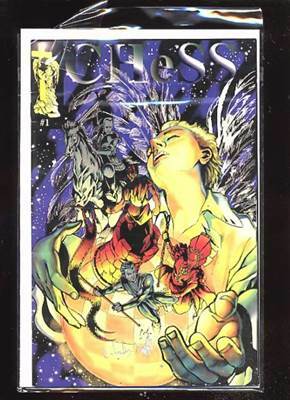 It's from a 2004 eBay auction for which I have nothing more than the description 'Chess #1 Comics Comic VF+ NM'. Now I was facing the brick wall. What to do? Document the problem in a blog post. What to title the post? Let's continue the series last seen in Chess Comics No.7: Punch Animated GIF (May 2014). Maybe something will turn up.